Article IV of the 1992 Collective Security Treaty offers a familiar formula for mutual defense. Borrowed from NATO’s Article V, the Collective Security Treaty Organization (CSTO) members (Russia, Belarus, Armenia, Kazakhstan, Kyrgyzstan, and Tajikistan) commit in Article IV to treat an attack on one as an attack on all. 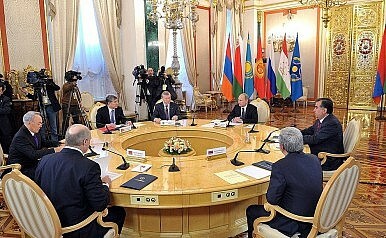 Yet immediately following the Turkish Air Force’s shootdown of a Russian Sukhoi Su-24 in late November, Belarus and the Central Asian CSTO members offered only tepid rhetorical support for their Russian ally in an attempt to balance between alliance obligations and their respective relationships with Turkey. Only Armenia, with its own longstanding conflict with Ankara, reiterated the Kremlin’s harsh rhetoric against Turkey. Neutral statements by Kazakhstan and Kyrgyzstan calling for restraint from both Russia and Turkey, along with the absence of a reaction from Tajikistan, evince a lack of commitment to the Moscow-led collective security alliance. However the CSTO’s ineffectiveness as a mutual defense bloc predates the Sukhoi crisis. The inability or unwillingness of the Central Asian CSTO states to support Armenia in its conflict with Azerbaijan limited the organization’s utility from its inception. With escalating tension between Azerbaijani and Armenian forces over the former’s separatist Nagorno-Karabakh region, this issue will continue to expose weakness in the CSTO’s mutual security clause. Like Azerbaijan, Kazakhstan and Kyrgyzstan are both Turkic nations. While pan-Turkism is hardly the primary motivator in either country’s foreign policy, cultural links do affect a certain inclination toward Baku in the Armenia-Azerbaijan dispute. Kazakh President Nursultan Nazarbayev and Kyrgyz President Almazbek Atambayev have both supported declarations by the Cooperation Council of Turkic Speaking States (CCTSS) that validate Azerbaijan’s position on the Nagorno-Karabakh dispute with Armenia. At its fifth annual summit, held in Astana in September 2015, the CCTSS adopted a resolution upholding the “territorial integrity and inviolability of the internationally recognized borders of the Republic of Azerbaijan.” This means that Kazakhstan and Kyrgyzstan believe the breakaway Karabakh territory, and surrounding Armenian-occupied districts, should be returned to Azerbaijan. As in previous years, the statement benefited from Nazarbayev and Atambayev’s signatures. Astana also carries its position on the conflict into Eurasian integration projects. Along with Belarus, Kazakhstan demanded in 2014 that the Eurasian Economic Union treat Nagorno-Karabakh and EEU member Armenia as separate entities under the organization’s customs regime, despite the two territories being de facto linked. For Kazakhstan, mutual strategic interests support symbolic and cultural ties with Azerbaijan. Thus, supporting Armenia might be consistent with the Collective Security Treaty, but Astana would do so at the expense of other priorities. On the critical issue of the Caspian Sea’s legal status, Baku and Astana both oppose the condominium favored by Russia and Iran. The two countries collaborate on defense projects, including joint military exercises and equipment sales. Such links make it difficult to envision Kazakh intervention against Azerbaijan on Armenia’s behalf, even if Baku directed military action against Armenia proper. Tajikistan is not a Turkic nation like Kazakhstan, Kyrgyzstan, and Azerbaijan. Nevertheless, Dushanbe also supports the restoration of Nagorno-Karabakh to Baku’s control. In October 2014, Tajik President Emomali Rahmon and Azerbaijani President Ilham Aliyev issued a declaration emphasizing the “inadmissibility of changing internationally recognized borders.” Even if Tajikistan wanted to intervene in the Nagorno-Karabakh conflict, the country’s security environment restrains its options. Tajikistan appears preoccupied with potential threats emanating from its southern border with Afghanistan. In May 2015, the CSTO conducted exercises simulating an Islamic State invasion of Tajikistan. The following month, Tajik and Chinese troops carried out similar drills. Armenia’s conflict with Azerbaijan is clearly not a priority for Dushanbe or the CSTO alliance, whatever their formal obligations. For its part, Armenia is at least somewhat aware of the CSTO’s impediments, but it is helpless to overcome them. In October 2014, after a meeting between Armenian President Serzh Sargsyan and alliance Secretary-General Nikolai Bordyuzha, Yerevan issued a statement complaining that Azerbaijani leader “Ilham Aliyev’s bellicose and Armenophobic statements do not receive an appropriate reaction from CSTO partners.” During the CSTO’s December 2015 summit, Sargsyan again admonished his nominal allies for their approach to the Karabakh conflict. The Armenian president juxtaposed the CSTO’s treatment of the issue against NATO’s solidarity with Turkey in the aftermath of the Sukhoi shoot down. While the CSTO member states agree on certain issues, mainly those pertaining to international terrorism, divergent interests on Russia’s dispute with Turkey, and Armenia’s conflict with Azerbaijan before it, restrict the organization’s cohesiveness. This undermines the integrity of the alliance’s mutual defense apparatus. At the December 2015 CSTO summit, Serzh Sargsyan declared that “every time the armed forces of the Republic of Azerbaijan use various small arms, mortars, and artillery systems against the Republic of Armenia they also shoot at Astana, Dushanbe, Bishkek, Moscow, and Minsk.” It is doubtful that all CSTO members, especially Kazakhstan, Kyrgyzstan, and Tajikistan, share this outlook. Update: Will Kazakh and Kyrgyz Troops Keep the Peace in Syria?Russia Proposes Deploying Kazakhs and Kyrgyz to SyriaCSTO Gathers in Tajikistan, Talks ISISCentral Asia: Dim Security Prospects Ahead?Who Postponed the CSTO Summit?